I loved seeing the boys enjoy the several inches (unheard of!) we received in Waco on Friday. Bennett wasn't too impressed with the snow but was willing to touch it. 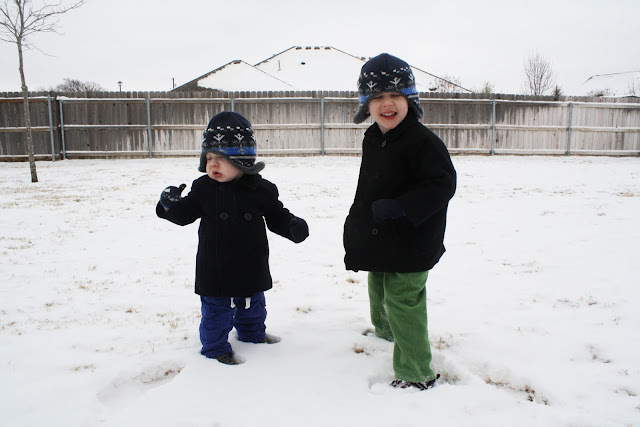 Of course, being in Texas, we have no snow gear. So, we tried to find the warmest clothes we could and go outside for about 15 minutes. It worked pretty well until Oliver completely into the snow and lost his little mittens. We reassured him that we'd go back inside in a few minutes and encouraged him to just play for a short while. 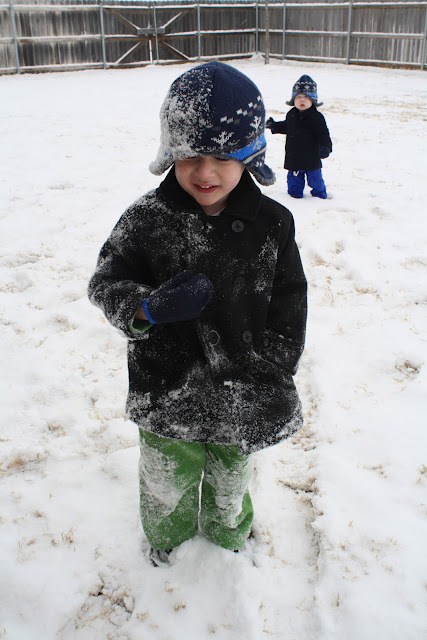 Dad helped redirect Oliver when he began throwing snowballs. Brian *loved* getting into the snow with Oliver. Ollie turned out to be pretty good at throwing snowballs. ...even trying to throw them at Mommy a few times. Oliver really enjoyed the snow for the first time ever. This is too cute for words!!! Thanks for sharing the adorable photos. Your boys are precious!